I know from all the emails and communication I receive that people are eager to create their ideal lives, and that they want to start living that life NOW. Not tomorrow, not next year, but today. I am a life, relationship, and law of attraction coach trained by Gay and Kathyln Hendricks at the Hendricks Institute, and I know A LOT about how to help others create their ideal lives. Also, and probably most importantly, I absolutely believe that anyone can make all of their dreams come true. Yes, even if you've been trying for years, or no one in your family thinks you can do it, or if you don't have a clue where to start, etc. Don't worry, I can help! Because I love helping others so much and because I know that each and every one of us can and should be living their dream lives every single day, I am pleased to now offer individual and group coaching sessions on an on-going basis. Let Me Help You Find Your Why! That's right, I said find your WHY! Not find your way, although I will help you do that as well. But I want to help you find your WHY! Your why is why you want to achieve whatever it is you want to achieve. For example, why do you want to achieve financial abundance, or meet your soulmate, or finally lose those last ten lbs? The why is what keeps you going on your journey to success, even when it doesn't look like things are happening, or you want to give up, or you just can't seem to see a happy ending from where you're standing. When you find your WHY, though, you'll never want to give up! And when you don't give up, success is inevitable. So let me help you find your why. *You want to have all the time in the world to spend with your family and kids? *You want to feel what it truly feels like to radiate happiness from every cell in your body? *You want to work from home and know what financial freedom really feels like? *You want to travel the world and be able to run your business from any internet cafe in the world? Ever since I launched this website, success has come to me in ways I never could have imagined. Doors opened and opportunities came flying at me faster than I was ready to handle, even in my wildest dreams!! I shouldn't have been too surprised, though. The truth is, things in my life always seem to have a magical way of working out, often times with very little effort on my part. Don't be fooled, though. This isn't the result of luck. It's the result of carefully following and implementing all the self help tools and techniques I have learned over 15+ years of reading as many self help and personal growth books I can get my hands on! I am now ready and eager to share that information with you, in such a way that life will be become like a waking dream for you, every single day. 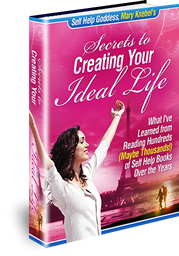 I know how you can create your ideal life, and I want to share this information with you NOW!! No more waiting, it's time for you to start living your dream life today! OK, enough talking. If you have any questions about either of the options above, please email me at maryknebel@yahoo.com and I will respond in 24 hours. We can design a plan that's perfect for you. If you're ready to sign up, go ahead and send me an email to maryknebel@yahoo.com and put "Strategic Life Planning Sessions" in the subject line. Let me know which option you prefer, and we'll get started immediately! I'm so excited to be able to offer you these options and to begin working with you one-on-one! Again, to sign up today or if you have questions, send me an email to maryknebel@yahoo.com.